Dance Until Your Brain Falls Out! 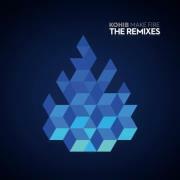 Kohib, a Scandinavian dance combo has just released Make Fire -The Remixes. It’s a CD featuring 9 songs of “Nu-Disco” on it, each track re-mixed by a different outfit, e.g. “Push Me Down” has four versions, remixed by four entities: track one, remixed by Stoyvind; track four and five are remixed by Boska (#4 is the “Boska 2010 Askefast Remix”, while track #5 is the “Boska 2011 Remix”) and #7 is the “Kohib Diskodans With Mika Remix”. Other guest remixers on Make Fire… include Syntax Erik, Frisvold & Lindbaek, Dennis Jr. and Lepetitgarcon. Another interesting track is “The Fang Song” which has two different versions: on track three it is done as the “Kohib Dub Remix” and track eight is the “Dennis Jr. Remix”. A song that appears only once on Make Fire… is “Tales From a Nomad”, a kind of psychedelic disco-club mix, it is rather entrancing and enthralling. The other two lone remixes are: track #2, “My Command” (Syntax Erik Remix) and track number nine, “Hear This” (The Lepetitgarcon Is Preparing For Parenthood Remix), a catchy remix title, if I say so myself. The latter song, (“Hear This”) is a quiet, chill-out remix, it sounds like an echo chamber in there and is a lysergic un-dance number that one would expect to find after a long evening with loud, breathtaking, ear-splitting dance numbers. This one is sure to bring one back to earth in a slow, easy way. If you’d like more information on Kohib, be sure to check their Facebook page out and you’ll find samples of their music, videos, messages from their friends and you can even click to become their friend too. Anyway, happy disco-dancing and enjoy!